If you have been thinking of having Christmas lights put up this year, you know how difficult it can be to find trustworthy professionals that won’t bust your holiday budget! We highly recommend you give the gentlemen at Christmas Light & Sirens a call- these local off duty DFW Firefighters have been in the business for 10 years. They are exclusively using commercial grade, SMD (Surface Mounted Diode) C9 LED bulbs. The brightest, longest lasting, C9 on the market- available in color or white. Equivalent to 7 diode bulbs making them 40% brighter, they are sealed and waterproof! They use SPT-2 18 gauge wire. What does that mean? It means the insulation is 0.045” thick not 0.030” providing longevity and UV light damage resistance. It means they care enough to use the highest quality product available to ensure your home looks good throughout the light season and for years to come. Now I bet you never gave much thought to a timer but with 225 customers they do! They use a 15amp 1850watt timer with a photocell. When the sun goes down, the lights come on. And the customer can choose 2, 4, 6, or 8 hours of light. Even sunset to sun rise if they prefer with a simple turn of the dial. Unlimited warranty work repair at NO cost! Just head to their Facebook page to check out their work and read all the positive reviews! In fact, they came out to my house last week to install my holiday lights and their customer service and workmanship was exemplary! If you have been thinking of having Christmas lights put up this year, you know how difficult it can be to find trustworthy professionals that won’t bust your holiday budget! We recommend you give the gentlemen at Christmas Light & Sirens a call- these local off duty DFW Firefighters have been in the business for 10 years. In one simple, affordable quote over the phone, they can provide installation, removal, and year round storage of your lights! This is a great deal because most companies make you provide your own lights and charge you extra when they take them down! Just head to their Facebook page to check out their work and read all the positive reviews! In fact, they came out to my house last year to install my holiday lights and their customer service and workmanship was exemplary! I plan to use them again this year! Beginning to decorate for fall is one of those warm and fuzzy moments. 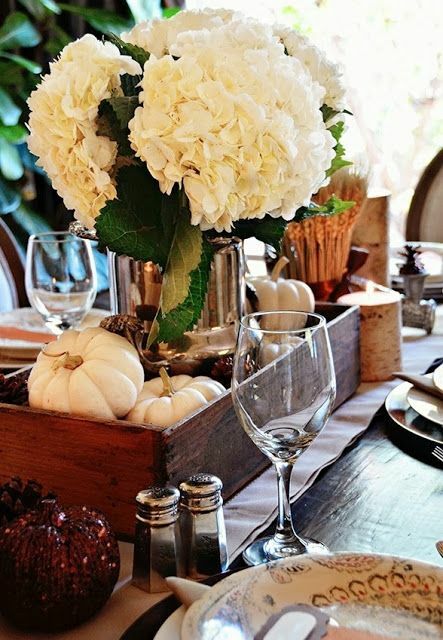 The rich colors, the cool and crisp weather, and all of the many, many pumpkin-flavored things that are no longer just an afterthought but front and center in your mind—just like your centerpieces. 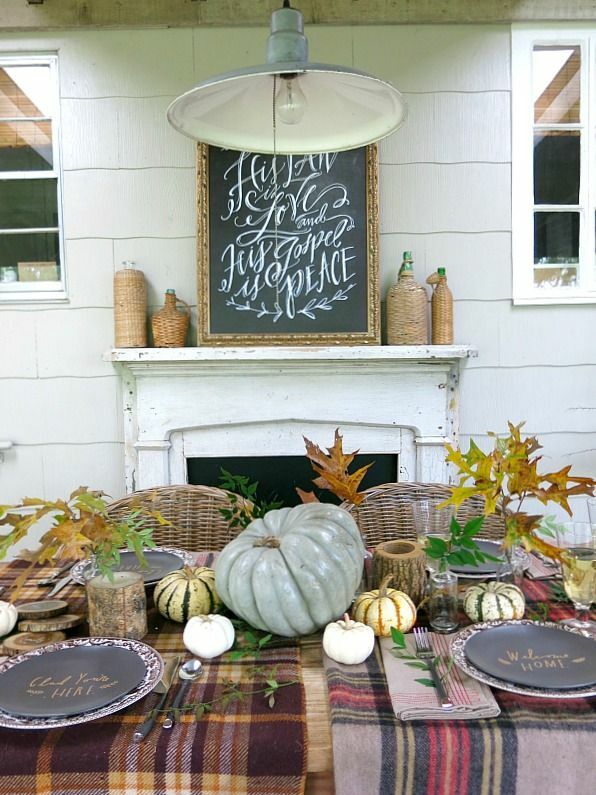 Fall time welcomes entertaining and lots of it. Now, we know you have a few recipes that are to-die-for, so why not create a centerpiece that’s just as fun for you and your guests? 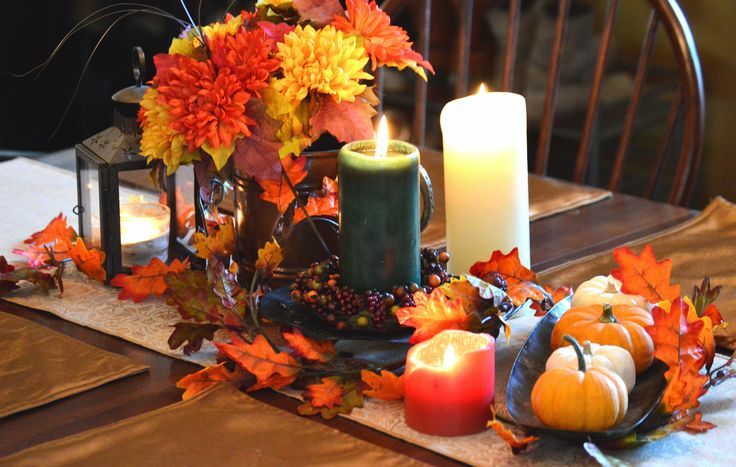 Here are some of the best ways to create a breathtaking fall centerpiece. It goes without saying that the classic fall palette is a pleasing monochromatic color scheme of deep red, orange, and gold. However, don’t be afraid to shake things up and go with something different. Play around with soft and toned-down hues of pale, powdery blues, grey, or even deep purple and green to give it a natural, earthy feel that is still warm and inviting. You want your display to be pleasantly surprising and not, er, alarming. Once you’ve arranged everything out on the table, you’ll most likely see a few gaps that you could leave empty or fill with a few extra pieces. Leaving the blank space will offer a more minimal look, and if you don’t have a lot of table space it’s probably a good idea for when you are serving food. However, if you do have enough space, that gives you some room to play, decor wise! Use candles with a pop of color that will both add a nice aesthetic element and some warmth once you light them. Or grab something like a wooden or brass piece to give it texture and character. Don’t be frustrated if at first it doesn’t work- just keep at it! • Aerate your lawn and dethatch it. • If there is plenty of rainfall, fertilize your lawn. If there is not- DON’T. • To help your grass beat the heat and reduce lawn maintenance, keep your lawn mower blade on the highest setting. Don’t worry if parts of your yard turn brown this time of year – it happens. • Trim and fertilize your containers – they still have time for another show in the fall. • Deal with pests such as aphids, whiteflies, and spider mites with a spray of water from the hose. • Continue deadheading (remove faded flowers) for prolific bloomers, shear them lightly to encourage more blooms. • Cut herbs to dry or freeze for winter use. • Fall vegetable and herb seeds or starters can be planted now. Consider spinach, radishes, carrots, beets, lettuce, overwintering onions, kale, kohlrabi, rutabagas, turnips, dill, cilantro, parsley, and chives. • Pick up and destroy fallen fruit from fruit trees to limit insect infestations. • Make sure newly planted shrubs and trees get plenty of water. • Early morning is the best time to water – target plants directly, and water deeply. Avoid getting leaves wet in the hot sun, and avoid soaking containers during the hottest part of the day – both of these can burn plants. We all have some of that inexpensive laminate furniture in our house that we are tired of looking at! But did you know that with a little effort, you can transform those cheap book shelves or dressers into something stylish and functional by just adding some color. Do you need to sand the project? With plastic, you can’t really sand the surface, but the best you can do is use a 320-400 grit sandpaper to scuff up the surface a little. A clean surface is a MUST! With laminate, you will depend more on the paint or primer adhering to a clean surface than you will a surface that is been scuffed with sandpaper. Clean very thoroughly with Windex or TSP- this is a crucial step because primer and paint won’t adhere to a dirty or greasy surface. Use an Oil-based Primer. Choose an oil based primer like Kilz or Cover Stain. Or another option, depending on the type of laminate you have, would be a plastic primer. You can always do a sample test by painting an inconspicuous spot of the furniture piece with primer, let it set for 7 days and see how well it adheres to the surface. Paint. Once you have a primer on the piece that will adhere well to the surface, you can use almost any type of paint over the surface of the primer. Anything from spray paint to latex will work. Clear Coat. Whether or not you decide to clear coat the piece will depend on how much durability you require. If you are doing cabinets or a table, then I would definitely recommend a clear coat. If you are doing a dresser or side tables, a clear coat is probably not necessary. We have had such a mild winter here in North Texas that the spring weeds are already starting to pop up! Follow these five easy and cheap steps to organic weed control to make your life easier! ~ Newspaper (the secret weapon) Start collecting newspapers all year long and use it up each spring. Step 2- Trim shrubs and perennials, then pull bigger weeds.Try to get the roots of the perennial weeds (like dandelions), but for the annual weeds just pull the biggest ones so that the paper can lay down flat. The layers will kill any little ones left. ~ The thicker you layer the paper, the more weed-blocking it will do. ~ Don’t use shiny, colored ads- just regular newsprint. ~ Overlap the edges of the papers a good inch or two as to not give an opening for the weeds. ~ Water well first, and then spray the paper as well. The mulch will help hold in the moisture for that time of year. If you use soaker hoses, lay the paper under them. Step 5- Lastly, cover all the paper with grass clippings (if you want to avoid any out of pocket cost) or mulch. The more you use, the better it will suppress weeds – a 2-inch layer is minimum. Tight on cash but you don’t want your mom to think you’ve forgotten her? You can’t deny that moms deserve a day to be celebrated, but every year Mother’s Day somehow creeps up on us much quicker than anticipated. So here are 8 completely free of cost ideas that will still make your mother feel loved on her special day! Spring is here and are you ready to do some big spring cleaning this weekend? You’ll need some spring cleaning essentials! This big chore doesn’t have to be so overwhelming when you have the right products to help you. I love these, and use them every year for my big cleaning marathon. I love Method brand products because they are natural! This Method All Purpose Cleaner has a great lavender scent and works on pretty much any surface in your home! If you have kids, cleaning their rooms and toys might seem like a daunting task. This Dapple Toy & Surface Spray is paraben-free, phthalate and dye-free, and harsh chemical free! If your vacuum is ready to retire, grab this Shark Navigator Lift-Away Vacuum! This is the vacuum I use and it’s absolutely amazing. It can be used on both carpet and hard floors and is really lightweight, too. It can get into those tight nooks and crannies that have been harboring dust and debris! Want to make life easier this year? Get yourself a bObsweep robotic vacuum! I have one, and seriously, I don’t know how I got all of the daily and weekly cleaning done without it! It works on both hard floors and carpet, plus has a TON of really neat features. It’s also one of the most reasonably priced robotic vacuums on the market. I give it 5 stars! You’ll definitely want a good window and mirror cleaner, and this ATTITUDE Window & Mirror Cleaner is made from pure essential oils! It helps glass surfaces sparkle and shine with an ammonia formula that’s also dye-free. That washing machine sure has worked hard for you, hasn’t it? Give it some extra love and make Tide Washing Machine Cleaner one of your spring cleaning essentials this year. It removes and dissolves odor causing residues that build-up over time. Don’t forget about the air you’re breathing, while you’re doing all of this cleaning! If you don’t have an air purifier yet, make this year be the year you finally have one! These Honeywell HPA104 True HEPA Allergen Removers eliminate 99.97% of airborne particles like mold, pollen and dust! If you’re a natural cleaner and love using vinegar, you may get a little sick of the smell. Score this Laundress Scented Vinegar that contains 100% natural vinegar with a scent that masks that icky smell! CLEVER! Don’t forget about your stainless steel appliances while you’re cleaning! This Caldrea Stainless Steel Spray comes in some really nice smelling options and uses olive oil to naturally tackle gross, sticky stuff on your appliances! If you have granite countertops, be sure you’re taking care of them properly! Using soap or other cleaners on them can damage them over time. I use Method Daily Granite Cleaner. It has a great apple scent, and is made just for granite counters to help clean and protect them! You’ll need a good mop, too, when you’re adding items to your spring cleaning essentials. I recommend this Mr. Clean Dry Erase Mop. It’s SUPER easy to use, and works REALLY well on your bathroom, kitchen and hardwood floors. An EASY way to dust is to use this Swiffer Duster w/ Extender. It extends up to 3 feet so you can reach high or hard to get to places in your home. Plus, the refills are super inexpensive, and you don’t have to use paper towels and rags anymore! Eating healthy is really important to my family. When I shop for fruits and vegetables at the grocery store, I want to be sure they are fresh. Debbie Meyer GreenBags have saved a ton of my produce from going bad! These bags keep your fruits and vegetables SUPER fresh for longer periods of time. Apricots Good apricots are firm and have a nice, solid amber color. Stay away from pale yellow or greenish colored apricots. Apricots that are too soft are no good! Blueberries You’ll want to buy firm, dry and brightly colored berries. If they are dull or watery, pass them up! Cantaloupe Perfect cantaloupes have a delicate aroma, yellowish skin and a thick texture on the rind. Do not buy cantaloupes with a sweet and pungent aroma or those that have a soft rind. Cherries Pick cherries that have new looking stems and a smooth, shiny surface. Bad cherries have dried steams and dull surfaces. Grapefruit Don’t bother looking at the color. Look for heavy, thin-skinned grapefruits that are slightly springy. Avoid thick or rough skin. Kiwi Good kiwi gives slightly when pressed. If it’s too hard, don’t buy it. Mangos Mango can be several different colors. The best way to test it is to grab a yellow fruit, and expect it to be slightly soft to the touch. It should have a ripe aroma at the stem. Oranges Good oranges are firm, heavy and have a smooth texture all over. You don’t want oranges that are spongey or rough. Papaya Choose fruit with a red-orange skin. Avoid green or hard papaya. Peaches A nice peach is firm and plump. You want it to be yellowish-orange with a little red blush around it. If it’s super soft, don’t buy it! Pineapple Watch for fruit that smells sweet at the stem and is heavy for its size. Plums The best plums are those that yield slightly to pressure. They should have a deep purple color and semi-soft tip. Rock hard plums should be avoided, as they won’t ripen. Strawberries Deep, shiny red skins are what you want. Avoid blemishes or green spots. Watermelon Good watermelons should be symmetrical in shape. They should have a cream-colored underside. Do not buy watermelons with cushiony spots. Artichokes Choose globes that have tight leaves and feel heavy for their size. The leaves should squeak when pressed against each other. Asparagus Good asparagus have closed tips and straight green stalks. Bad asparagus have open tips and the stalks are curved. This is the first sign of wilting. Avocados Avocados feel slightly soft to the touch. Firmer avocados may be ripened at home, but avoid rock-hard ones. Also avoid avocados with cracks or dents. Beets Pick firm beets with fresh stems and slender taproots. Avoid beets with wilted leaves, scaly tops, or large, hairy taproots as they may be older and more woody. Bell Pepper A bell pepper of any color should have bright and glossy skin. They are firm and thick, while bad bell peppers have soft spots and shriveled surfaces. Broccoli To pick a nice batch of broccoli, you want it to be firm. It should have closed florets and have a deep green color. Stay clear of broccoli that are yellow in color, with open florets and water-soaked spots. Brussels Sprouts Choose firm, compact, bright green heads. Avoid sprouts with wilted or loose outer leaves. Cabbages Firm, compact heads that feel heavy for their size are the best. Check that the stems are also fresh and compact. Carrot Picking carrots is easy. Carrots that are firm and have a bright orange color are good. Bad carrots have a rough texture, soft and have green roots. Cauliflower Choose heads with tightly packed, creamy white florets. Avoid yellowed, spotted, or flowering florets. Celery You want firm, unblemished stalks. The stalks and leaves should be green, not yellow. Corn Pick corn with bright green husks and moist but not slimy silk. Peel back the husk to ensure the kernels are plump and not dry. Cucumbers Choose cucumbers that are uniformly green (not yellow). Eggplant You want an eggplant that is shiny, heavy for its size and firm. A slight bounce back will indicate a great piece of eggplant. Don’t bother with the ones that are dull or lightweight. Garlic Pick firm, plump heads. Avoid heads with soft spots or green sprouts. Green Beans Slender beans that snap rather than bend are green beans you want. Avoid bulging or dried pods. Lettuce, Spinach, and Other Leafy Greens Choose greens with fresh, crisp leaves. Avoid any that are wilted or slimy. Peas You’ll want crisp, green pods. Avoid bulging, dried, yellow, or white pods. Potatoes These should be firm, smooth potatoes. Avoid those with bruises, green spots, or sprouts. Radishes Go for radishes with fresh, green tops and firm, unblemished roots. Summer Squash The best squash has naturally shiny, taught, unblemished skin. Avoid squash that appear dull or have soft spots. Sweet Potatoes and Yams Choose potatoes with firm, unwrinkled skins and no bruises or cuts, as they are highly perishable. Tomato Good tomatoes are plump, smooth and have a rich red color. Bad tomatoes look shriveled and have blemishes. Winter Squash Choose squash that have stems intact and feel heavy for their size. Avoid squash with cuts or soft spots. Knowing that your fruits and vegetables are ripe and ready to use or eat will save you time and money. Cooking some broccoli for the family tonight? Make sure that head is firm and green! Baking a peach pie for dessert? Watch for that red blush around the fruit. Get ready to grab some great quality fruits and vegetables on your next trip to the grocery store! What tips and tricks do you have for choosing fruits and vegetables? On April 12th, the Dallas Arboretum’s Cool Thursdays Concert Series, presented by Wells Fargo, presents Neon Circus, a Brooks & Dunn Tribute Band. Enjoy Dallas’ only concert series overlooking the picturesque White Rock Lake on the award-winning Martin Rutchik Concert Stage & Lawn. Tickets are selling fast, and available to purchase online. When Brooks & Dunn decided to hang up their hats in 2010 after a successful 20 year career on the road, it left a big void in the hearts of their fans. In 2011 the concept arose to form a tribute act that would rival the duo’s touring road show and live sound, and Neon Circus was born. Named after the 2002 tour, Brooks & Dunn’s Neon Circus and Wild West Show, Neon Circus has been successful in continuing the legacy of the country music icons with the help of RK Ford (Ronnie Dunn) and Tim Johnson (Kix Brooks). Currently Neon Circus is touring the U.S. as a headlining act in showrooms, theaters, festivals, fairs, large clubs and private functions. Neon Circus has accurately recreated Brooks & Dunn’s exciting live show down to the last detail performing hit country anthems like My Maria, Neon Moon, and Boot Scootin’ Boogie. In addition to the coolest view of White Rock Lake, attendees can bring picnics and beverages or purchase food items from food trucks including Easy Slider, Rick’s BBQ, Ruthie’s Rolling Cafe and So Cal Tacos. The gardens are also open to stroll through before the concert to enjoy the breathtaking floral displays. The concert series continues through June. Gates open at 6 p.m., and the concerts begin at 7:30 p.m. Single tickets start at $10 – $27 and are available for purchase online. For group tickets of 15 or more, call 214.515.6520. On-site parking is complimentary for all concerts, and the Arboretum encourages attendees to take advantage of the close covered parking available at the parking garage located across the street from Rory Meyers Children’s Adventure Garden with access underneath Garland Road. For full concert lineup, click here. For more information, visit www.dallasarboretum.org or call 214.515.6500. April Fool’s Day is coming soon and if you want to get back at your kiddos for all the tricks they play during the year, here are a few easy and mostly FREE and fun prank ideas for kids! ~After everyone goes to bed on 3/31, turn as many things upside down as you can- including framed pictures, clocks, chairs and toys. When the family wakes up in the morning, they’ll do a double-take and let the laughter begin! ~ Freeze a bowl of cereal with milk the night before & watch your kids try to dig in! ~ Make instant Jell-O according to package directions, except pour it into juice glasses with straws and let it set up over night. Your kids will think it’s juice but then they will also get to eat Jell-O, which is a fun treat! ~ Stuff toilet paper into the toe of your kid’s shoes. ~ If you have ceiling fans in your kids’ bedrooms, use a hole punch to make a ton of confetti. Place it on top of the fan blades & it will “rain” confetti when they turn on their ceiling light. Plus, then they have to vacuum their own room! ~ Put a few drops of food coloring in the bottom of a cereal bow & cover it with cereal. When the milk is poured in the bowl, it will change color! ~ Set out a mixed bowl of Skittles and plain M&M’s! ~ Remove the caps from the shampoo or conditioner bottles & cover the opening with plastic wrap. Replace the caps & wait outside the bathroom door to hear their frustration! ~ Leave the plastic wrap on the American cheese on your kid’s sandwich! ~ If you have snack bag sized chips for your children’s lunches, open the bags from the bottom & switch out the snacks. Cheetos become Lays, Fritos become Ruffles, etc. Then tape the bottom of the bag closed & your kids will have a confusing lunch! ~ This last idea is for your tween or teen’s! Get ahold of their phone and set up keyboard shortcuts. Then, for example, every time they text the word “the,” it would automatically change to “MY MOM ROCKS”! You can really use your imagination with this one and personalize it to be the most fun for your family! For some more great ideas, head to Personal Creations. Let us know if you have done any of these tricks before and how they worked out! It’s time to do some spring cleaning! Here are some spring cleaning tips to get you started. Air out – Get all the germs, smells, and toxins out of your house. Open your doors and windows and set ceiling fans on low. Airing out mattresses a couple times a year also reduces dust and dander. While the windows are open wash the linens and vacuum and rotate your mattress..
De-Clutter – Tackle a closet a week and clear out all the items you no longer use. I do the one-year rule. If I haven’t worn it in a year, I don’t need it. Donate these items to charity. We get emails and mail all the time with donation trucks in our area. Get some shoe racks , baskets, or shelves to better organize yourself. Clean Furniture – If you have a leather coach make sure and clean and treat it. I put a note in my calendar every three months and do it on that day so I don’t forget. Protect wood floors by checking the pads on furniture feet and replacing as needed. De-Dust – Check the often overlooked areas, such as light fixtures and ceiling fans. Dust down house plants and check the corners of your walls to see if there an any dust or dander. Kitchen Spruce Up – Clean your refrigerator by wiping down the shelves and drawers with a non-toxic cleaning solution made with two tablespoons baking soda dissolved in a quart of warm water. And don’t forget that extra fridge in the garage! Tackle the microwave next by heating a coffee cup of water mixed with 2 tablespoons of lemon juice on high for 3 to 5 minutes, just long enough for the solution to boil and steam up the microwave. Keep the door shut for a minute longer, and then carefully remove the hot cup. Wipe away loosened grime with a soft cloth. Sanitize the garbage disposal. Drop a few lemon slices and two tablespoons of baking soda down the disposal. Run the grinder and then rinse with hot water. These are just a few ways to tackle your spring cleaning projects! Here is to a happy & clean home! *Shower at night – Showering in the morning is great for helping you get your day started, but if you can, alter your schedule to have your bath or shower at night. This rinses and washes off the allergens that stick to your face and hair and irritate you while you sleep. *Change your filters – Set your A/C to recycle the air inside your home, and keep your windows closed. You’ll also want to rinse or change your filters every couple of weeks to ensure that pollen and other irritating material aren’t trapped in it. Home Depot often has wonderful deals on air filters to keep your budget in check while you’re changing them more frequently. *Manage your laundry – When you’ve been outside, allergens stick to your clothing. Keep clothes that have been worn outside contained by placing them immediately in the washer or hamper when you get home. You’ll also want to wash your bedding once a week with HOT water. *Cover your eyes – Wraparound sunglasses are great for blocking UV rays, but also prevent airborne allergens from getting in your eyes. You can also use allergy-relieving eyedrops like Visine-A a few hours before heading out for the day. *Check your pets – Pets spend time outdoors, and track allergens into your home without you even knowing! If you allow your pets to sleep on your bed with you, you’re risking a better chance at irritation from those allergens. At least keep them off furniture, if possible. *Trim your lawn – Shorter grass blades don’t trap as much pollen from the surrounding trees and flowers. It’s worth it to pay the teenaged neighbor to cut your grass if you’re sensitive, and once it’s done, you’l definitely feel the difference. *Schedule your workouts – When you workout, you breathe at least twice as fast as normal. That means you’re breathing in more allergens. Morning exercisers have it the worst because airborne allergens peak during early hours. The best time for a workout is in the mid-afternoon. If you’re a runner, hit the pavement right after it rains, and the pollen has been washed away. On the downside, you’ll want to run while it’s still wet outside, because once the air dries, the moisture generates more pollen and mold. *Keep hydrated – Hydrating helps to thin the mucus and hydrate your airways. If you’re working out, be sure to take a water bottle with you, and once you’re ready to head back home, fill it up again and use that to rinse your hands and face to rid them of pollen they probably collected. Here are some essentials for you and your home that will definitely aid you in enjoying the spring season with less sniffing, coughing and itching! *AllerTech home products: pet shampoo, vent guard, laundry additive, home spray and more. These products can eliminate pollen and allergens from your home, making it a more comfortable place to live. *Flonase – allergy relief for your nose!